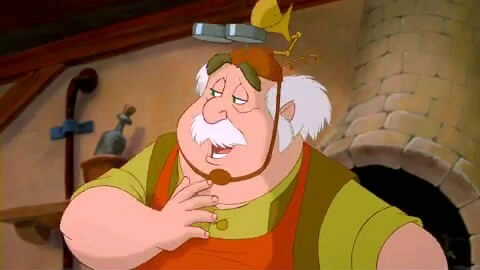 Belle from Disney's "Beauty and the Beast" is one of the most popular of the Disney Princesses. While Belle from Beauty and the Beast first came to real fame with the smash hit 1991 movie "Beauty and the Beast," Belle's history goes back further than that. Of all the Disney princesses, this is probably the one that little girls most look up to these days and see as having a nice balance of qualities between being strong and adventurous while still ultimately wanting to find romance in her life. The story of Belle is from a traditional French fairy tale that goes back hundreds of years. The first known published version was by a woman named Gabrielle-Suzanne Barbot de Villeneuve. 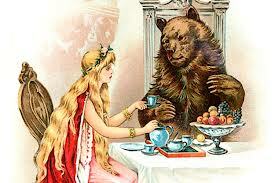 She wrote a very lengthy story with many intricate subplots and a beast who is truly dangerous. Her story was adapted by Jeanne-Marie Le Prince de Beaumont a few years later and published in 1756. Beaumont's version is the one we recognize as the true birth of Belle and her fabulous story of beastly love. Three teenage sisters of a wealthy merchant live together in a mansion. The two eldest daughters are wicked and cruel, while the youngest, Belle, is lovely and pure of heart. Their father loses his money and the family is forced to move to a small cottage and take up jobs. A few years later, the father learns that one of his ships that was believed lost at sea in fact has returned to port and may contain valuables. Before going to inspect the ship, he asks his daughters what they would like for him to bring back as presents. 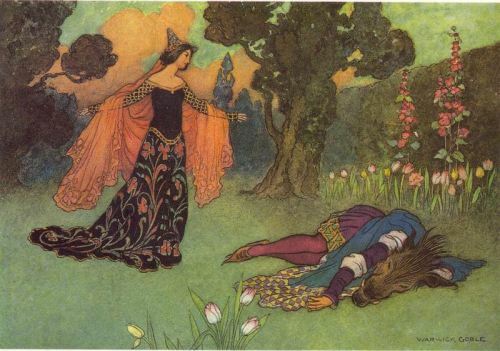 The two eldest ask for gifts of great value such as jewels and fancy clothes, but Belle only asks for a rose that only can be found in the area which the father will be visiting. The father goes to port but finds that the ship's cargo has been taken to pay his debts. On his journey home, he gets lost in a forest. He finds a beautiful palace which is fully provided with food and drink. After spending the night, he prepares to leave, but first stops to pick a rose for Belle as her gift. A Beast suddenly appears and accuses the father of stealing his most prized possession. 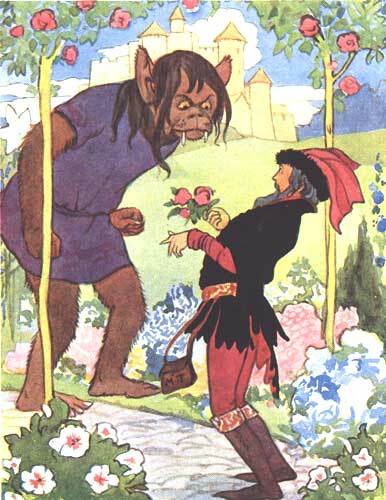 When the father protests that he only wanted a gift for his youngest daughter, the Beast lets him go with the understanding that he will return to face punishment. The Beast also gives him presents for the other daughters. 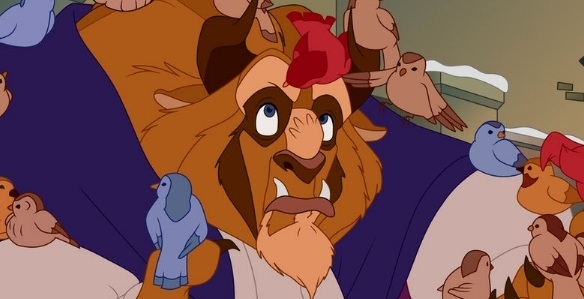 The father returns home and gives his daughters their presents, but he tells Belle about his deal with the Beast. 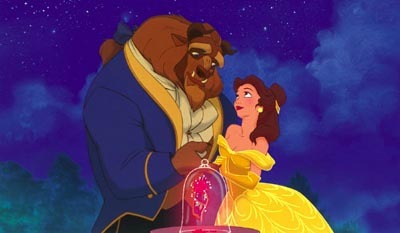 He has Belle go to the Beast's castle to serve as a prison in his place, and she is greeted warmly. The Beast gives her many presents and lets her have the run of the castle. He asks her to marry him every night, but she refuses every time. Belle has dreams of a handsome prince asking why she wouldn't marry the Beast, but her answer is that she only thinks of him as a friend. 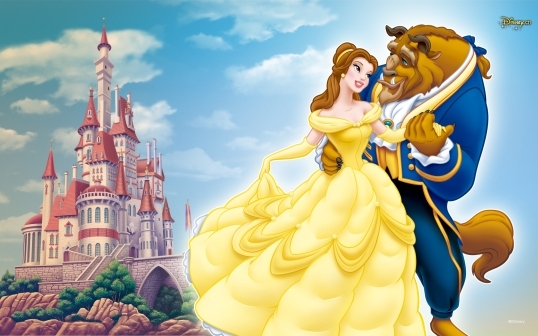 Belle mistakenly comes to believe that the prince in her dreams is being held prisoner by the Beast, so she searches all through the castle for him without success. Belle lives at the castle in fine style for several months like this, but eventually becomes homesick. The Beast allows her to return home only if she will return in a week. 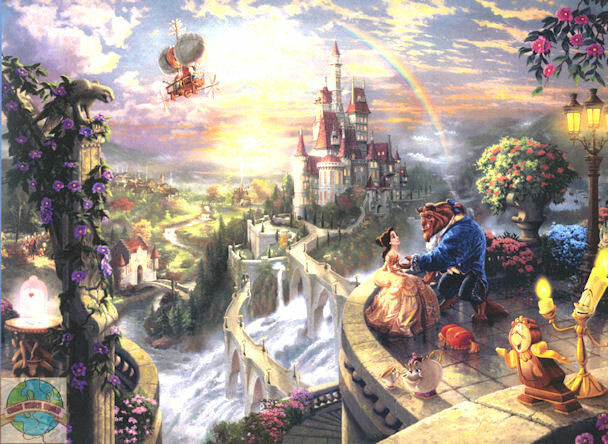 Belle sets off with an enchanted mirror and ring, the mirror showing what is happening back at the Beast's castle, and the ring enabling her to return to the castle instantly. 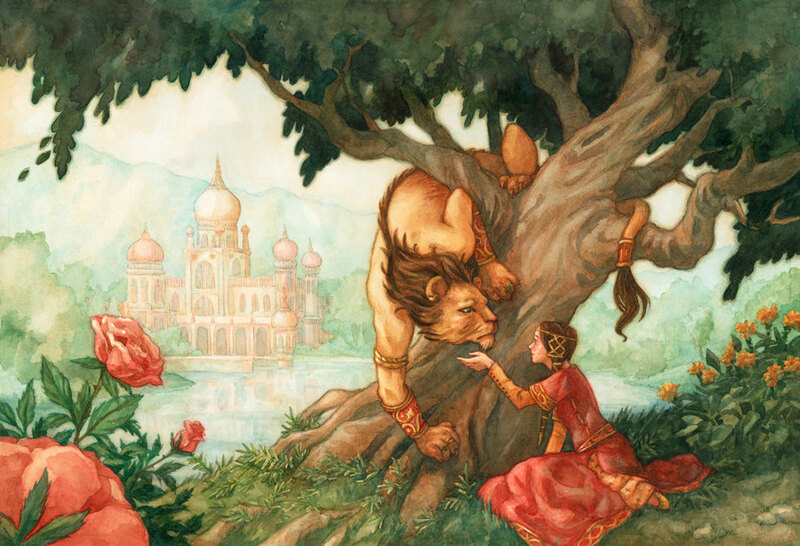 Upon her return home, her sisters are envious of her wealth and happiness and convince her to stay longer than the Beast allowed in the hope that the Beast will be angry and eat her. 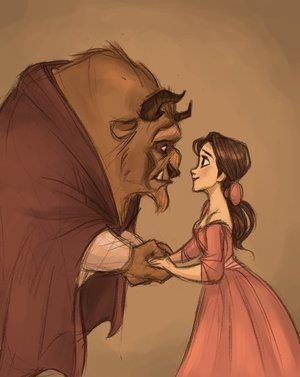 When Belle looks in the mirror, though, she sees that the Beast is dying from heartbreak at the fact that Belle has betrayed him, so she uses the magic ring to return to him immediately. Belle returns to find the Beast almost dead. She cries over him and tells him that she loves him. 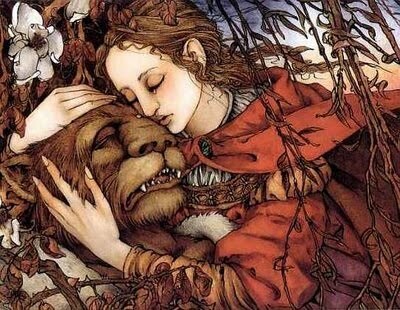 Her tears transform the Beast into a handsome prince, the one from her dreams. It turns out that the Beast had been cursed by an evil fairy long before because he had not let her stay the night during a storm. Only finding true love, in the person of Belle, enabled the curse to be broken. Belle and the Prince live happily ever after. Walt Disney Studios took the idea from the classic fairy tale and changed it a bit to make it more palatable to modern viewers. Belle becomes the one who decides to stay at the castle, making a conscious choice to sacrifice herself for her father. 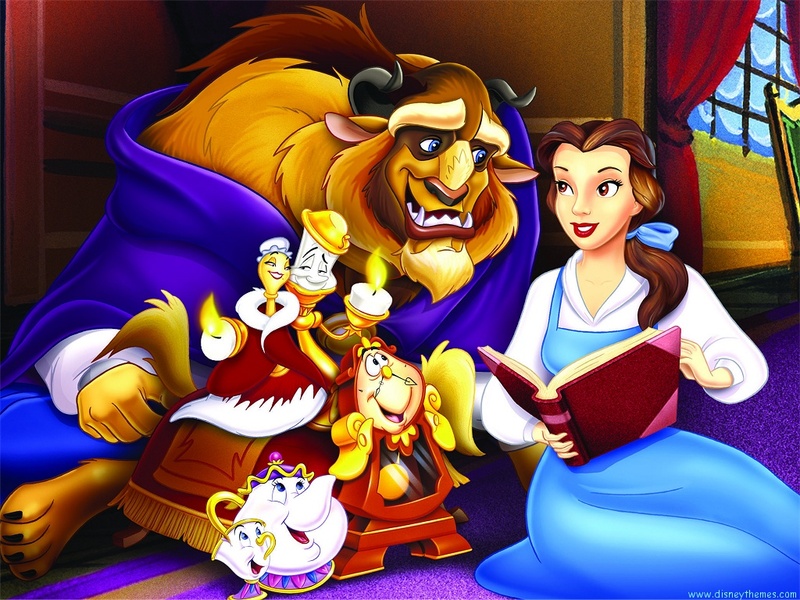 Belle appeared in the smash hit Broadway musical "Beauty and the Beast" which ran from April 1994 until July 29 2007. 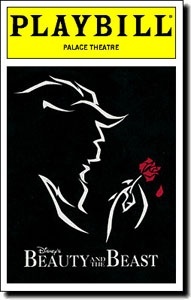 "Beauty and the Beast" quickly sold over $700,000 in advanced sales – a Broadway record. After its successful first season, the musical was nominated for 9 Tony Awards, including Best Musical, Direction, Book, and Original Score. It ran for 13 years and finally was replaced by the Disney play based on "The Little Mermaid," so they were just changing which Disney Princess they would feature on stage. Actresses that played Belle included Susan Egan, Debbie Gibson, Toni Braxton, Jamie-Lynn Sigler, Christy Carlson Romano and Anneliese van der Pol. Alan Menken and Tim Rice added a song, "A Change in Me," which became a fixture of the musical. For many, the Broadway show is their real connection with "Beauty and the Beast." Walt Disney, of course, invented feature film animation with the 1937 Disney movie classic "Snow White and the Seven Dwarfs," and he had been working on shorts for 15 years prior to that epochal film. "Snow White," with its lush technicolor and memorable songs, was an island of delight in a sea or black-and-white melodramas from other studios, and the public was hungry for more. "Snow White" ushered in what is known as the "Golden Age" of animated Disney movies, which lasted through the sentimental "Dumbo" and tragic "Bambi." 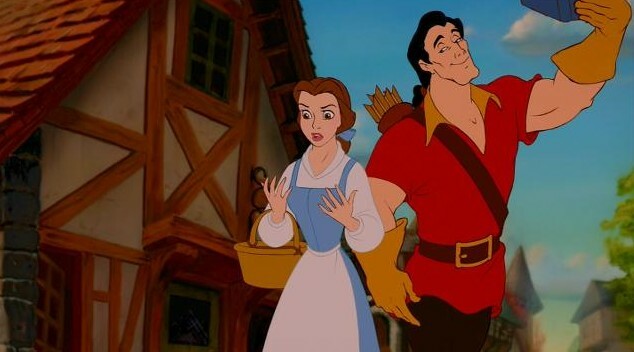 Walt Disney even considered making "Beauty and the Beast, but he ran out of time. World War II disrupted everything, and while Disney movies got back on track in 1950 with "Cinderella" and the subsequent "Alice in Wonderland" and "Peter Pan," times were changing fast and lavish animated musicals (and musicals in general) were going out of style. Walt Disney Pictures lost its way after Walt's death in 1966 and retreated to non-animated films starring kid-friendly actors like Don Knotts and Tim Conway, with middling success. Nothing wrong with that, but a lot of good opportunities were lost in those days to advance the art of Disney movie animation. All that changed with "The Little Mermaid," which ushered in what is known today as the "Disney Renaissance." "Beauty and the Beast" (1991), directed in heroic fashion by Gary Trousdale and Kirk Wise, followed a couple of years later and marked Disney's attempt to build on "The Little Mermaid"'s unexpected success and rekindle Disney's past glory from the Golden Age of animation. Did it work? It worked gloriously! There had been other recent stirrings in the animation field, such as with 1988's "Akira" and "The Land Before Time," which focused attention on new well-crafted animation films. Disney's own "The Little Mermaid" a year later had gotten the ball rolling, but there had been false starts before. "Beauty and the Beast" cemented the Disney movie revival that lasted through to 1999's "Tarzan." 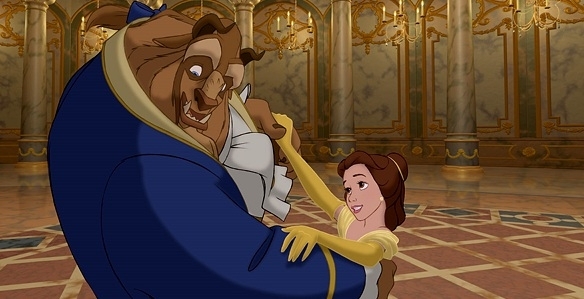 "Beauty and the Beast" came out in the days before massive computer-generated graphics, so this is a traditonal hand-drawn film that bears the standard Disney movie mark of quality. 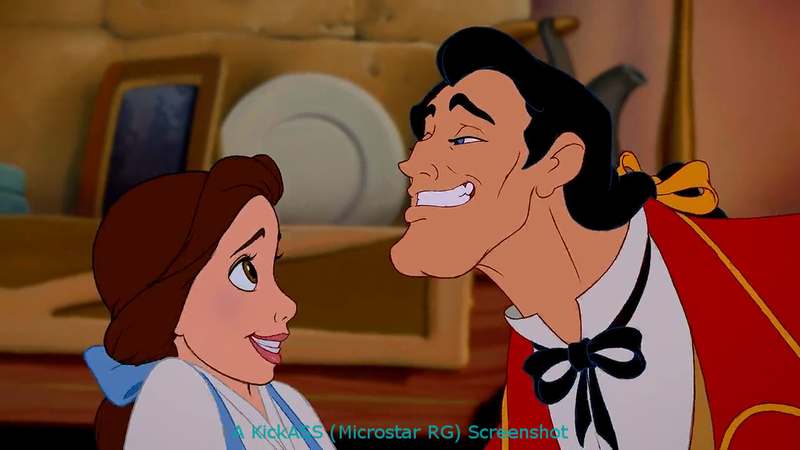 As usual with a classic Disney movie product, it involves a love-lorn girl looking for her prince. "Beauty and the Beast' was put together in just two years, which is very little time for animated features that usually take five or more years. Teams in Glendale, California and Lake Buena Vista, Florida (Disneyworld) worked on the animation, using the Pixar CAPS program of computerized graphics first tried out on "The Rescuers Down Under." This program restored some of the variety of colors and soft shadings lost when Disney went away from hand inking and toward the new xerography process with "101 Dalmations" to cut costs. The CAPS program also provided a primitive form of 3D animation by separating the characters from the background, giving some depth to the animation. CAPS further combined computer imagery and hand-drawn characters seamlessly. 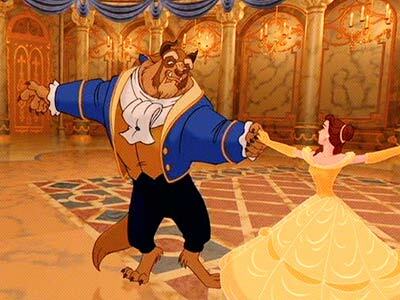 The almost magical ballroom sequence, in which Belle and the Beast dance while the camera circles, was a triumph of this process and instigated intense development of computer animation processes, so you have "Beauty and the Beast" to blame for the later over-use of CGI in almost every action/adventure/science fiction film. Here, though, it is used sparingly and in just the right places. "Beauty and the Beast" won two Oscars for its songs (credit Harold Ashman, who sadly passed away during production, and Alan Menken, who went on to become the composer of choice for Disney movie musicals). 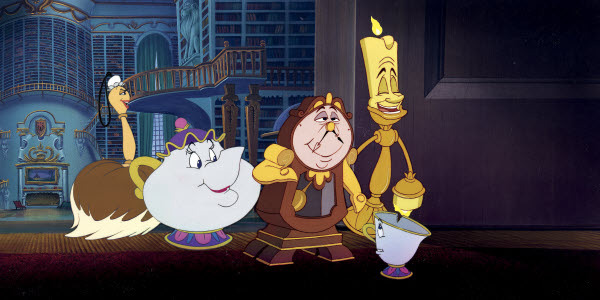 "Beauty and the Beast" also was nominated for Best Picture, a true rarity then for an animated film. 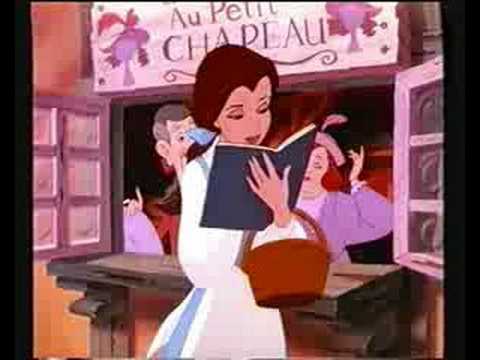 The opening operetta-styled "Belle" is a fan favorite and was the first one composed by Ashman and Menken. Other popular songs include "Be Our Guest," sung to Belle by the servants when she first comes to eat, and "Gaston," sung by the swaggering Disney movie villain. The songs were recorded live, with the orchestra and voice work together, rather than separately as is the more customary modern practice. This gives the recordings some echo and may take away a tiny bit of "radio-like" precision from "Beauty and the Beast," but it injects an energy and sense of "being there" that cannot be duplicated otherwise. 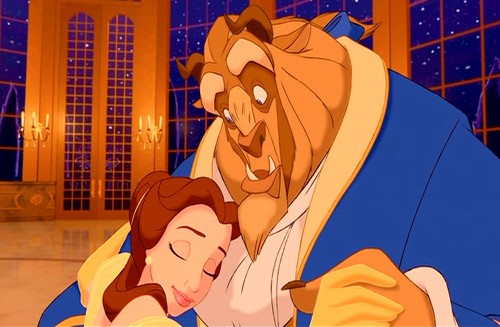 "Something There" lets Belle and the Beast sing of their developing feelings and is one of the most romantic moments in "Beauty and the Beast." 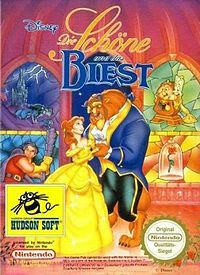 Céline Dion and Peabo Bryson perform a pop version of "Beauty and the Beast" over the end credits (Angela Lansbury sings it earlier in a somewhat tremulous but sincere voice as her character Mrs. Potts) which became a Top Ten hit in both the United States and the UK. 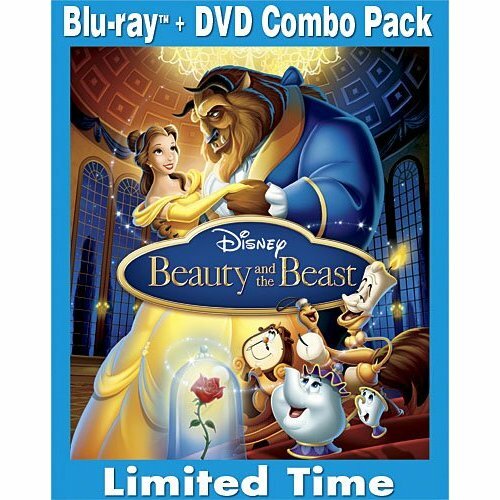 Home video releases of "Beauty and the Beast" have music videos by Dion and Bryson along with later ones by Jump 5 and Jordin Sparks (on the 2010 Blu-Ray/DVD release). "Beauty and the Beast" was a breakthrough in that it was the first Disney movie to be adapted into a Broadway musical, a practice that subsequently became commonplace. A lot of research went into making "Beauty and the Beast," and it shows throughout "Beauty and the Beast." Art directors preparing for "Beauty and the Beast" travelled to France and studied many great 18th Century painters who remain little-remembered today. Many of the paintings shown on the castle walls are copied from such classic French artwork. That respect for the material - new for animation with "Beauty and the Beast," but after this the standard in the industry - gifts "Beauty and the Beast" with a unique classical and ornate look that elevates "Beauty and the Beast" far above the pack of toy-oriented mass-merchandising animated Disney movies and Pixar/DreamWorks products that followed. You may even absorb a tiny bit of culture while being entertained without realizing it, as watching "Beauty and the Beast" is like touring Versailes or an exquisite French chateau. 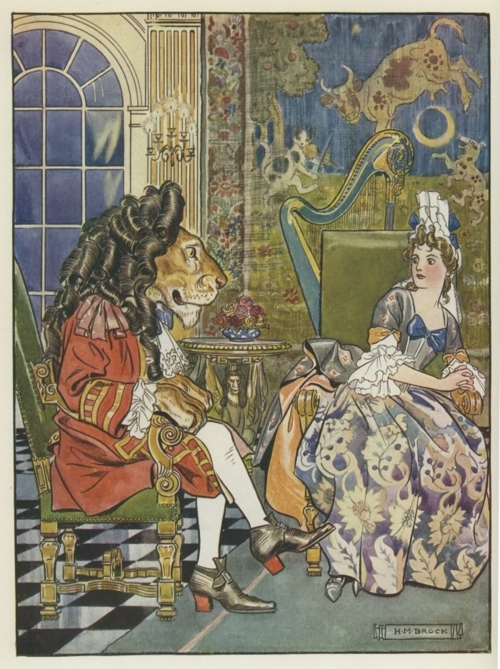 The expressiveness on Belle's face as she takes the Beast's hand in the intensely decorated ballroom, and his awkward grunting as he fumbles with awkwardness that rapidly disappears, is priceless. There is no question that "Beauty and the Beast" is a very entertaining film with a legion of fans, and not just young girl fans, either. "Beauty and the Beast" is well worth a look even if you don't normally like musicals or romantic fairy tales or "princess" Disney movies. 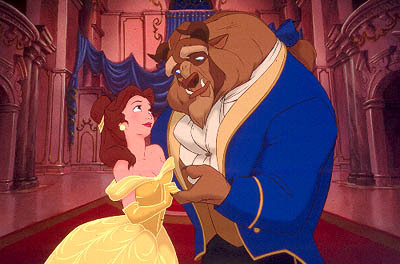 "Beauty and the Beast" was the first animated film to get nominated for the Best Picture Academy Award, and the last for many years due to the addition of the "Best Animated Feature" category until "Up" and "Toy Story 3" came along after the annual nominations for Best Picture were doubled from five to ten. The recent 3D release of this film has garnered very positive reviews, with some particular scenes - such as the key ballroom dance - much enhanced. Disney did a fine job with the 3D conversion, and that is the version to see if possible. The 2011 3D trailer is below for your viewing pleasure, and below that the climactic ballroom dancing scene, accompanied by Angela Lansbury singing "Beauty and the Beast."